Life Before the Dinosaurs: Ottoia. Ottoia was a strange priapulid worm that lived in tunnels and then ambushed its prey. Ottoia stuck a weird appendage out of its head to grab prey and pull it into its hole. The image below includes Diaphora, an ancient bivalve, Yohoia, a relative of a shrimp, the shed skin of an Anomalocaris pincer, Leanchoilia, and Ottoia. 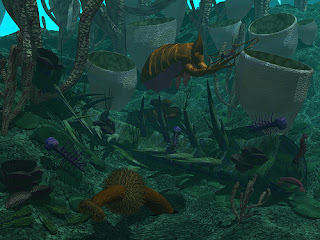 Ottoia ate small trilobites, and hyolithids like Haplophrentis. 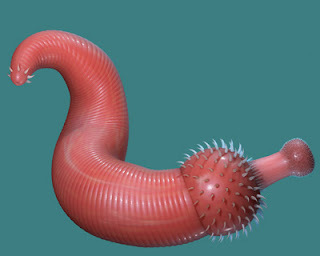 Opabinia was one of its predators. Can I request Wiwaxia somewhere down the line? Thanks, I really love Wiwaxia and I'm sure I will do a post of Wiwaxia. Tomorrow!! !